Salem Lakes Village Board members pecked away at coming up with a new chicken ordinance at Monday’s committee of the whole meeting. After about 90 minutes of discussion, the board appears to be moving toward allowing chicken keeping on smaller lots than the two acres required by the current ordinance. But there is not yet a consensus among the board on what size lot to allow chicken keeping. Trustee Ted Kmiec said he favored allowing chickens on any size single family lot, representing the most lenient viewpoint. Trustees Ron Gandt and Dennis Faber said they would favor allowing chickens on lots as small as 10,000 square feet, about a quarter of an acre. All board members appear to be in favor of limiting the number of chickens allowed on a particular size of residential property. Much of the discussion centered around a model ordinance introduced by a group of residents led by resident Peter Poli. 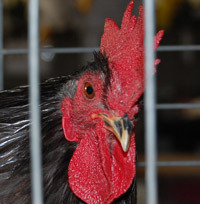 That model included a permit that would be mounted to a coop stating many of the chicken related specifications of a property, easing enforcement. That model also included a sliding scale for how many chickens could be kept on various sized properties, and would allow any single family residence to have some chickens. The group broke out chicken keeping best practices from a draft ordinance the village has on hand into a separate brochure. Poli pointed out that there are people keeping chickens within the village now against the provisions on the current ordinance, but generating no complaints from neighbors. “You’re not getting calls on those,” Poli said. Poli asked that if the board wanted to make changes to the model that his group submitted that the board give notice to the group so they could give feedback on the changes. Ultimately, the board agreed with a suggestion from interim village administrator Mike Murdock to let staff attempt to merge the draft ordinance from code enforcement officer John Carrier, Poli’s model ordinance and feedback from the Village Board into a new draft ordinance that could be considered at a future committee of the whole meeting.